[Ed. Note: U.S. elite men’s and women’s rosters for the 2019 UCI Cyclocross World Championships that will take place February 2-3, 2019 in Bogense, Denmark, will be announced January 22. Following the scrutiny that surrounded the U23 women’s roster selection, CXHAIRS contributor, Amanda Nauman, took a closer look at the eligibility requirements and analyzed who should survive the final selection process and make the squad. Maximum start positions: six plus Pan Am Champion for seven total spots. 5. If positions remain, then athletes may be selected by the USA Cycling Selection Committee following USA Cycling Principles of Athlete Selection. Any athlete seeking discretionary selection MUST complete the World Championship CX Discretionary Athlete Nomination Form on the USA Cycling website. 6. The top-three (3) ranked athletes on the UCI Individual Rankings as of January 15, 2019 provided those athletes are ranked in the top-fifty (50) overall. 7. The winner of the 2018 Elite Men’s Pan American Cyclo-cross Championships provided that race is held in its entirety and and run under UCI regulations. 8. The winner of the 2018/2019 Elite Men’s National Cyclo-cross Championships (race held December 16, 2018) provided that race is held in its entirety and run under UCI regulations. 10. The athlete with the most accumulated UCI Ranking Points from the following six (6) UCI Category 1 events. If any of the following UCI events are downgraded from UCI C1 race status, that event will not be used as a selection race. If any race not on this list is upgraded to UCI C1 status, it will be added in this list. 11. If positions remain, then athletes may be selected according to UCI ranking among athletes in the Top 75 Elite Men as of January 15, 2019. Of this list, if rule #11 stands true, Werner, White, Hyde, fall into the Final Selection Category. Clark, Kaiser, and Kisseberth would be the remaining elite men in the top 75 eligible for the discretionary selection. Driscoll and Ortenblad are excluded assuming their injuries still stand. Hecht and Haidet are U23 Men. If you’re keeping track at home, that’s only six men out of the eligible seven (thanks to White’s Pan-Am win edging out Canada) who make the discretionary cut. Lindine, Thompson, Dillman, Bradford-Parish and Smith remain in the top 100 of the elite men but are presumably ineligible if the rules are followed explicitly. It should be noted that Dillman did not petition for a Worlds spot as he feels he’s not back at the level he wants to be at if competing in Europe. That being said, if he DID petition for a Worlds spot, he would actually be ineligible to be picked. Despite a 4th place finish at National Championships, his UCI ranking would not be good enough (and as someone who’s invested in his success on our team that really irks me.) In this same vein, if Jeremy Powers petitioned for a Worlds spot, he is also technically ineligible. Sickness and injury-plagued seasons are no match for the goal of acquiring points. Lindine and Thompson had great seasons as well and I’m curious if any men ranked outside of the top 75 will be selected to fill the squad. 1. Any U.S. eligible athlete placing in the top three (3) at the prior year’s World Championships in the same event and category. In order to maintain their position on the Team, the eligible athlete(s) must continue to demonstrate the ability to finish in the top three (3) at the World Championships during the current racing season. This evaluation will be based on results from major international competition and current ranking on the appropriate UCI Individual Classification. If more than one rider meets this criterion, then the rider with the highest placing will be nominated. 2. Any U.S. eligible athlete who places first (1) at a UCI Elite Women’s World Cup event in the United States in September 2018. 3. Any USA eligible athlete who places in the top-three (3) at a UCI Elite Women’s World Cup event in Europe from October-December 2018. 8. The winner of the 2018/2019 Elite Women’s National Cyclo-cross Championships (race held December 16, 2018) provided that race is held in its entirety and run under UCI regulations. 9. 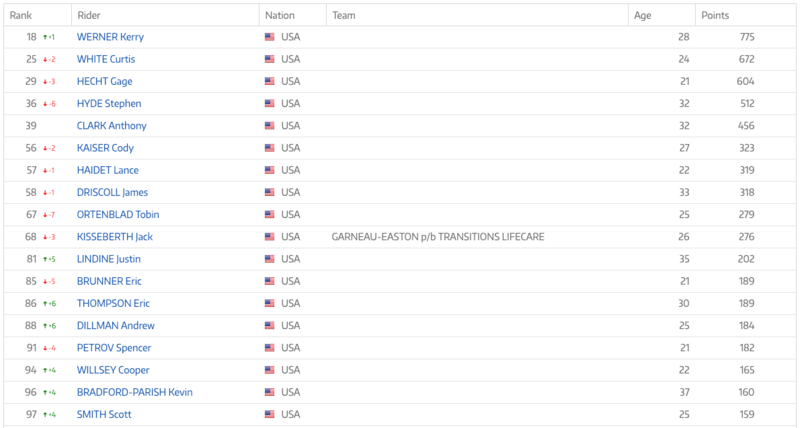 Any U.S. eligible athlete placing in the top-ten (10) at a UCI Elite Women’s World Cup event between the dates of October 21, 2018 and December 26, 2018. If more athletes meet this criterion, than there are places available on the team, the athletes with the highest placing in a World Cup will be nominated. If two or more athletes achieve the same World Cup finish result, the athlete with the highest World Cup ranking as of December 27, 2018 will be nominated. 10. The athlete with the most accumulated UCI Ranking Points from the following six UCI Category 1 events. If any of the following UCI events are downgraded from UCI C1 race status, that event will not be used as a selection race. If any race not on this list is upgraded to UCI C1 status, it will be added in this list. 11. If positions remain, then athletes may be selected according to UCI ranking among athletes in the Top 50 Elite Women as of January 15, 2019. Of this list, if rule #11 stands true, Keough, Compton, Noble, fall into the Final Selection Category for the six available spots. Runnels, Anderson, Fahringer, Gilbert, McFadden and Anthony would be the remaining elite women in the top 50 eligible for the discretionary selection. Honsinger and Clouse are U23 Women. If rule #11 means the remaining team is picked solely on points that would include Runnels, Anderson, and Fahringer. Had an American won Pan-Am Champs we would’ve had an additional spot for the team, but alas we can only hope we’ll have seven in the game in 2020. I’m not sure why the elite women are held to a higher standard than the elite men, but the rules state that the discretionary athletes must be ranked in the top 50 whereas the men must be in the top 75. I will point out that in Schieken’s interview with Scott Schnitzspahn, USA Cycling Vice President of Elite Athletics, Schnitzspahn said they wanted to “make it equal between the U23 men and U23 women.” Where USAC argued that they didn’t want to make the process for the U23 women different from the U23 men because this would appear to be treating the categories unequally, they clearly did so for the elite men and women. From a logical standpoint I understand the difference because our elite women are much more dominant in the world rankings than the men, and increasing our allotment to the top 75 would throw 7-10 more names into the hat. On the other hand, decreasing the allotment to the top 50 for the men would eliminate Kaiser and Kisseberth from the pool and we’d have a four-man squad. So yes, I get it. But equal is equal if that’s what we’re claiming to strive for. On the topic of U23 selection commentary, Madigan Munro was selected to the team as a Junior 17-18 while being ranked outside of the top 150 selection criteria for the U23 women. Again, I understand why from all the arguments that were made. I get it: she’s got potential and she petitioned. But if we’re going to allow for flexible rules like that, then Lindine, Powers, Thompson, Dillman and Bradford-Parish should be flexibly eligible to fill the men’s team with whatever performance-oriented marker arguments you want to use. Will USA Cycling fill the seventh open spot on the Elite men’s side or leave it open? Please note this analysis was based on the January 8th rankings, 1 week prior to the Jan 15th rankings that will be used for the final selections, and are shown in the photos above. Opinions are my own. 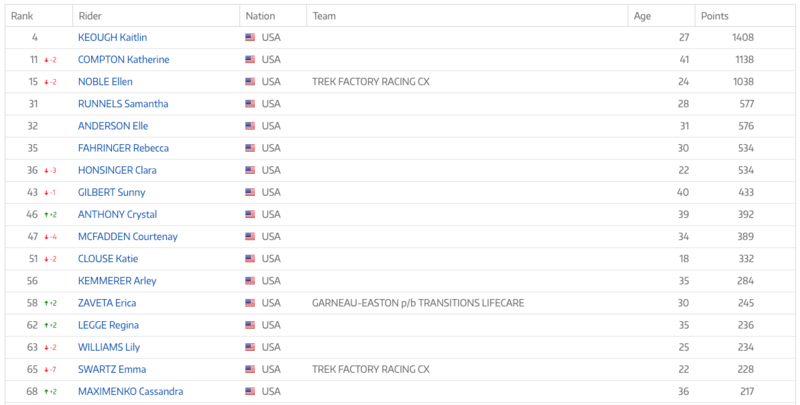 I obviously had skin in the game for this analysis and the in-depth nature of this is primarily due to my own goal of (unsuccessfully) trying to make the 2019 team [more on that here: http://ninerbikes.life/naumancx ]and secondarily due to being a nerd. Feature photo © 2018 Ethan Glading. Follow him on Instagram at @thepenultimatestage. If you’re looking for some cycling nerdery for your ears, check out the full slate of podcasts from Wide Angle Podium.